Located in the southernmost part of Mallorca and bordered by the municipalities of Lluchmajor, Porreras, Felanich, Satany and Las Salinas, Campos has one of the most beautiful natural ecosystem in the Balearic Islands. It has stayed away from tourism until a few decades ago. The best way to start discovering Campos is to go through the cobbled streets of its historical center and contemplate the reddish color of its houses. The neoclassical church of San Juan, the seven defensive towers of the XVI, the Old Neogothic Hospital, the Oratory of San Blas, the House of the Villa of the XV or the Aljibe of the Font Santa are its most outstanding monuments. A good place to relax the whole body after the walk is the Banys spa in Sant Joan de la Font Santa. These are the only hot spring baths in the Balearic Islands. Some waters that already gave rest to the Romans in 117 AC. And if you are interested in the distant past, you can visit the archaeological sites and pretalayóticas funerary caves. Campos is comprised of six population centers which provides a good range of leisure activities thanks to an attractive market and the fairs of harvest and handicrafts in October and May respectively. In August, with Artnit de Campos, gastronomy, art, cinema, music, fashion and photography are combined in a very special summer night. For those who love bicycles, Campos hosts the Sa Voltadora in May, a day where you can admire vintage style bicycles. If what you want is to admire the natural landscapes of the area, the best way is to tour the cycle routes along the more than 50 km of rural roads. With a little more than eight thousand inhabitants, Campos welcomes tourists who come in search of tranquility, sunlight, coastal gastronomy and an unspoiled nature in the vacation periods. Its 9 km of coast toasted by a radiant sun, makes Campos an ideal destination for traveling with family or friends. Es Trenc: a 3 km of unspoilt sand, warm water with a spectacular range of colors, Es Trenc is one of the most famous and most visited beaches in Mallorca. Ses Covetes: The beach of Ses Covetes is divided into a part of fine sand and a rocky part. It is an ideal place to relax and enjoy the sun and sea. S'Arenal de Sa Rapita: S'Arenal beach is a dune system with a magnificent natural environment, bordered by the Nàutic Sa Ràpita Club. Its fine sand, pine trees and its blue-green waves make this beach an ideal place for lovers of windsurfing and/or surfing. Es Pregons Grans y Es Pregons Petits: These two beaches enjoy a great tranquility and a beautiful unspoiled environment with clear and transparent waters. Es Molí de S’Estany: Es Molí beach is a beautiful place to relax and enjoy the golden color of the sand, the charm of its pines, undergrowth and juniper. Es Freu de ses Covetes: this relaxed U-shaped beach has a striking rocky area where its warm waters form a beautiful mix of green, turquoise and blue sky. In addition, besides the fabulous beaches, there are children's areas, fountains, parks and ice cream parlors so that the little ones also enjoy. 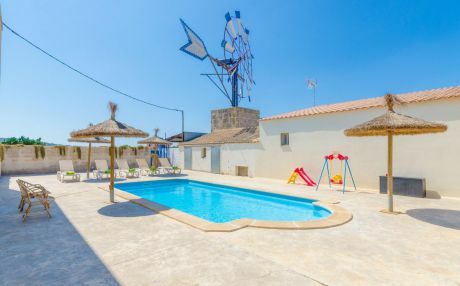 If you wish to travel as a group or family, it is best to rent a villa with a private swimming pool or a house or chalet that will allow you to feel like you are in your own home. This type of holiday accommodation allows you to enjoy the comfort and freedom of independent housing. 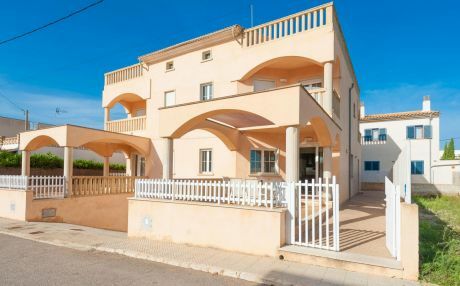 Campos is a cozy municipality where you will find wonderful holiday homes and independent chalets. 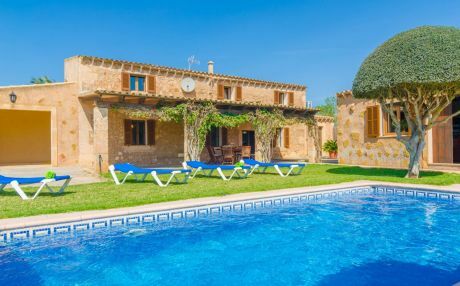 In our website we have a great selection of villas in Campos where you can enjoy a memorable family vacation.